Dr. Kea Tijdens is a Research Coordinator at AIAS/University of Amsterdam and a Professor of Women’s Work at the Department of Sociology, Erasmus University Rotterdam. She studied Sociology and Psychology at Groningen University, and obtained her PhD in Sociology in 1989. She is the scientific coordinator WageIndicator and a member of Webdatanet, INGRID, and EDUWORKS. 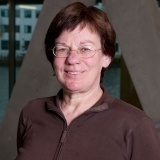 For WageIndicator she developed the web survey on work and wages, and performed the systems design for global databases on minimum wages, labour law, and collective agreements. Her publications focus on women’s work, wage setting processes, measurement of occupations, and bias related to volunteer web surveys. See publications and grants.